"When we were preparing the IPO of VTB, Russia's 2nd largest bank, our Board of Directors wanted to provide an opportunity for Russian private investors to apply. The task was not easy - it was only a third retail IPO in Russia - with a lot of legal and organizational details unclear - and we had only 4 months to complete the transaction. By one of investment banks that was working with us, we were recommended to hire Solid Solutions. From the very beginning we were impressed by the level of experience and commitment that this company demonstrated. Nigel Morris was working very closely with our team in Moscow. Although not a Russian speaker, with his extensive experience and knowledge about retail IPOs and privatizations, he was an invaluable source of advice. The transaction was recognized as the most successful retail IPO in Russia - we attracted over 120 thousands individual investors, raising over US$1,6 bn of capital." "We were keen to make buying shares in our IPO as much like the "Moneysupermarket online experience" as possible. It was also important that, in line with our business model of running a tight ship, the amount of resource allocated to the project was minimised. Solid Solutions understood immediately what we wanted and needed, and a team of just three, namely our Head of Marketing, Nigel and myself, implemented the retail offer. This included appointing suppliers, designing the UK's 1st completely on line application website and drafting all documents and material. Solid Solutions knowledge of how to run IPOs at both strategic and practical levels was invaluable." 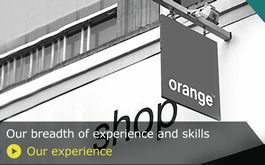 "We initially appointed Solid Solutions to advise and project manage our planned retail offer in 2004, however despite all the logistics being in place and receiving enough indicative retail demand to buy the whole company, the IPO did not proceed as the company was sold to private equity. Then in 2007 when further consideration was being given to an IPO we appointed Solid Solutions again on the strength & quality of their work on the previous project. Solid Solutions have always shown enormous commitment and have provided excellent advice and support to our team." 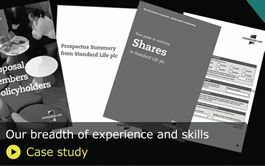 "Solid Solutions played a vital role in Standard Life's demutualisation and flotation. We had to carry out a number of large-scale communication exercises, including mailing over five million customers around the world, which required faultless execution. We relied on Solid Solutions' expertise to help us plan and deliver our communications in a timely and cost-effective way that met all the legal requirements. We were impressed by their knowledge, skill and dedication to the task. Their unique experience was invaluable and thanks to their advice we could feel confident that the many contracts with external suppliers provided excellent value for money. And we enjoyed working with them." "At Friends Provident we made the fortunate decision to appoint Solid Solutions right at the outset of planning our demutualisation and IPO in 2001. Throughout the duration of the project they gave us clear advice, based upon experience, on what was going to be required in terms of the complex logistical processes. Their sleeves-rolled-up, hands-on assistance and dogged attention to detail belied their consultancy status and contributed significantly to the successful completion and the listing of Friends Provident." "3i Share Offer was one of the 1st private share offers to use the Government's Share Shop scheme, developed for privatisations, for selling shares to private investors. Solid Solutions brought along their knowledge and expertise of this to manage the retail offer for us, which resulted in demand from private investors of £196m - 25% of the shares on offer. Not only was the retail offer successful in monetary terms it raised the profile of the company."